It has been too long since our last blog post! Here is a short update of what I have been upto ... I attended a photography and food styling workshop with Helene Dujardin end of March with a few bloggers and food writers, continued my two days per week of consuming 500 calories and still firmly believe it's all for better health, Easter came and brought 3 hot cross buns, endless chocolates which I'm still struggling to get through and visited Auckland museum and the art gallery, spent 23 hours in Christchurch attending a family funeral, made plans with Miss 5 to bake a strawberry shortcake later this month and on Anzac Day a visit by an old friend! ... a lot more happened in between ... I visited our local member of Parliament to discuss issues facing Bahai's in Iran. Maman was away on a completely un-planned tiki tour of New Zealand and we crossed paths in Christchurch. She arrived home today happy and ready to look after her chooks. I am looking forward to a long weekend visit by Master 7 and Miss 5 later this month. 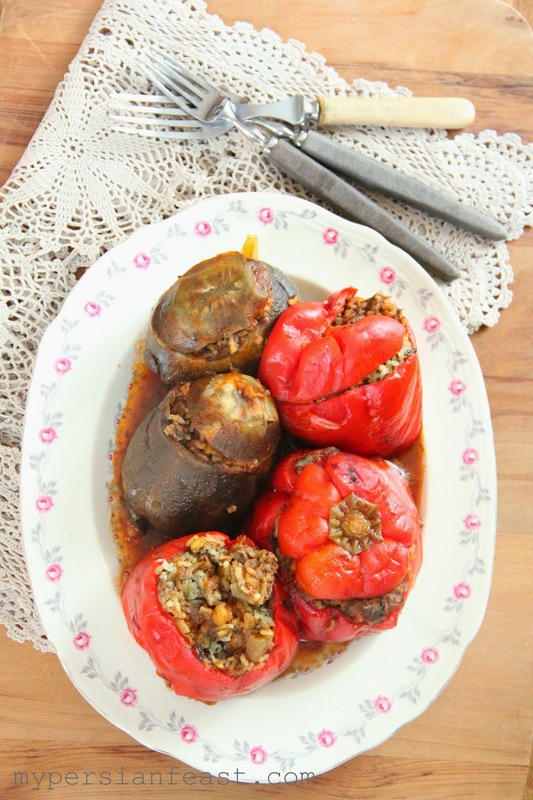 I made these stuffed veggies a few weeks ago for no reason other than I was given a can of Turkish stuffed vine leaves and it reminded me of stuffed capsicums, but I also wanted to learn how to make them. I realised this is quite easy and does not require a great deal of experience. If you want to give it a go you'll need to visit your Indian grocer and buy chana dal (or Lapeh in Persian shops). Chana dal looks very similar to yellow split peas but has a different texture, flavour and holds its shape once cooked. Wash and soak chana dal and rice for a few hours. Saute onions with a little oil and turmeric. Add mince and stir to ensure the mince does not stick to the pan and that it browns evenly. Add herbs. Par-boil the rice and chana dal and add it to the meat. Stir in salt and pepper to season. Cut the top of each capsicum and discard the seeds. Fill each capsicum with the meat&rice mix to about 1cm off the top (room for rice and chana dal to cook). Place the tops back on the capsicums. Place the capsicums in a pot. Fill the pot with 1/2 cup water and 1 tablespoon of tomato paste. Cook on low heat for about 45min-1 hour until the sauce has thickened and the rice is completely cooked.